There has long been a debate bout the dose response curve, action spectrum and mechanism for the production of infrared cataracts. Some scientists believe that the damage mechanism is purely thermal, others suggest that there is some evidence that it could be photochemical. If the mechnism is photochemical, a strong wavelength deedence in the near infrared spectral region will be present, and this will hve great significance for lamp safety, IR-A medical devices, occupational exposure limits and the design of industrial eye protection. With the advent of high-power infrared Leds and diode lasers as well as wavelengthptuneable infrare lasers (e.g. 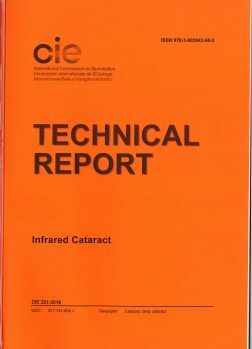 Titanium Sapphire laser), it is now possible for the first time to conduct a definiteve and conclusive laboratory study of the action spectrum for infrared cataract. Manufactureress of Leds, lamps and lasers should be intensely interested in the result of such studies. If the aetiology (cause) is purely thermal, the ambient temperature as well as the spectral content of the infrared irradiation becomes important and this is reviewed in this report. Currently the weight of evidence suggests that the aetiological mechanism is thermal. This publication is written in Englisch, with a short summary in Frenchg and German. It consists of 30 pages with 13 figures and two tabel and is availbale from the CIE webshop of from the NSVV. The price of this publication is € 96,- Leden van de NSVV krijgen 66,7% korting op deze prijs!